The New Yorker columnist Andy Borowitz delivers the perfect response to Trump’s week from hell. The White House appears to be in tatters in the wake of the release of excerpts from Bob Woodward’s new book, “Fear, Trump in the White House,” the publication of an anonymous opinion piece by The New York Times detailing resistance efforts within the Trump administration, and questions surrounding the confirmation hearings for Trump’s Supreme Court nominee Brett Kavanaugh. New York Times best-selling author and comedian Andy Borowitz was quick to respond, taking to his column – The Borowitz Report – with a series of hilarious articles published by The New Yorker. The first article in the series, published on September 4th and titled “White Man Hopes to Land Job Without Background Check,” took aim at Brett Kavanaugh. Kavanaugh, said that he was “pretty chill” about his upcoming job interview because he had been assured that “anything super damaging” had been removed from his H.R. file. 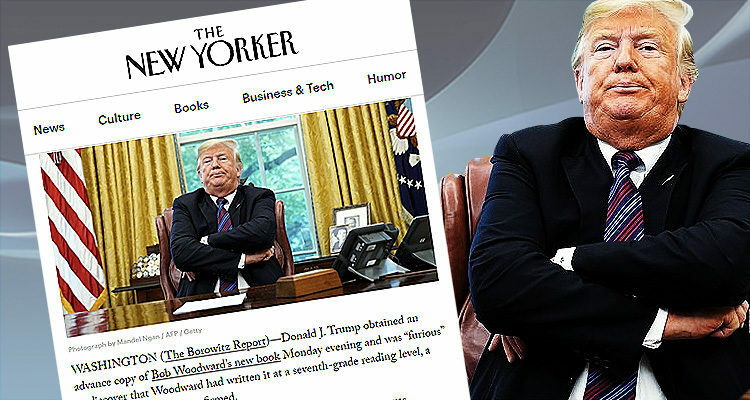 The following day, September 5th, Borowitz took on the controversy surrounding this week’s release of Woodward’s new book. Trump’s daughter Ivanka is dreading that she will be called upon to read the Woodward book aloud to her father, as he has demanded she do with books by James Comey and Omarosa Manigault Newman. Borowitz’ next two articles dealt with the anonymous op-ed piece published by The New York Times dealing with the resistance movement within the Trump administration. “Nation Stunned That There Is Someone in White House Capable of Writing an Editorial,” was published on the 5th and “Pence Blasts New York Times and Vows Never to Write for It Again,” was published the following day – September the 6th. The final article in the series, “Trump Demands to Know Who Put “Entering Crazytown” Sign on Oval Office Door,” was published on Friday, September the 7th and addressed Trump’s call for Attorney General Jeff Sessions to investigate the author of the anonymous New York Times op-ed. Trump demanded on Friday that Attorney General Jeff Sessions investigate who put a sign reading “Entering Crazytown, U.S.A.” on the door to the Oval Office. Trump reportedly noticed the sign for the first time Friday morning, and became enraged after asking Kellyanne Conway, the counsellor to the President, to read what it said to him. According to White House insiders, determining the creator of the sign could prove difficult, because between seventy and a hundred White House staffers have been known to use the word “Crazytown” to describe their work environment.